This plaid design is simply timeless. 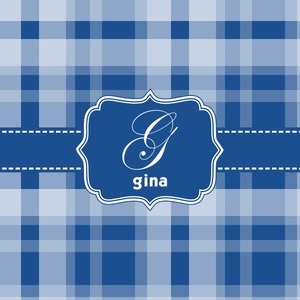 We choose to showcase it in classic blue and white, the pattern is quaint and reminiscent of easier days. You can however choose any color you want. We have 100's of colors to choose from - so you can create you own personal design in practically any color you want. We chose a decorative blue label trimmed in white and ribbon with stitching also trimmed in white. You will have a choice of label and ribbon styles to choose from. To do or not to do personalization? That is of course a personal choice. We choose an elegant name and initial; you will have many personalization styles to choose from e.g, monogram, names, graphic & text and of course other name and initial styles..